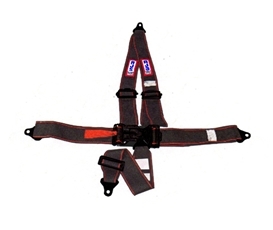 Seat Belt, 5 Point, V-Mount, "ELITE"
The Elite series seat belts feature lightweight aluminum adjusters, black E-coating on all parts, black strapping with red stitching. Bolt-In roll bar mount. 3" Sub belt. Pull down adjusters. 16.1 SFI certified. NOTE: Due to this product being SFI certified and dated they are shipped directly from the manufacturer.